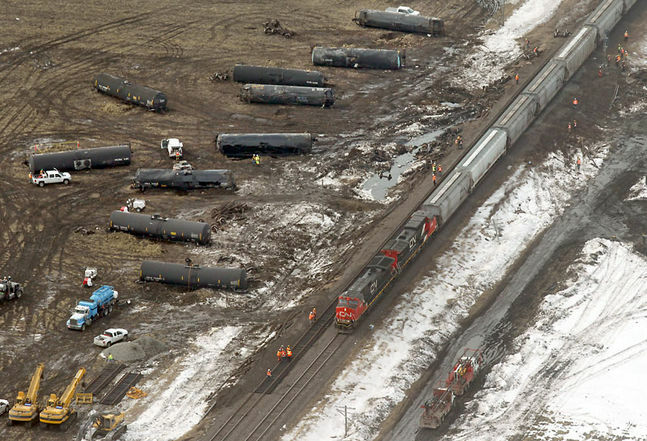 A Canadian National Railway train derailed on CN’s mainline March 11 near Gregg, about 50 km east of Brandon, Manitoba. 13 cars carrying refinery cracking stock, a type of bitumen, fell off the tracks and one of the tank cars spilled about 30,000 litres. An emergency plan was activated, and crews are working with Manitoba environment officials to clean up the spilled product (CBC News). An emergency action notice has been issued to CN to ensure the material is disposed of appropriately (Winnipeg Free Press). This derailment follows several other major derailments of CN oil trains in northern Ontario that involved crude oil spills, fires and damages to the environment. Read CN Railway Derailments, Other Accidents and Incidents for more information on many other CN derailments in Canada and the United States. ~ by railroaded on March 12, 2015.